Individual Butterfly Release: The butterflies will be shipped in individual containers. Once you are ready to release the butterflies, pass them out to your guests and each guest can release their own butterfly! Additionally, the guest can keep the individual container as a keepsake from your butterfly release. Mass Butterfly Release: The butterflies will arrive packaged together in a decorative mass release container. When you are ready to release the butterflies, simply pull the lid off the top of the mass release container (there are a variety of color combinations to choose from) and they will all fly out. How do you ship your butterflies and how do they survive? Our butterflies are shipped overnight express with FedEx and will arrive the day before your event. The butterflies are packaged in a specially designed insulated cooler with freezer packs to keep the butterflies at a cool and comfortable temperature during their transit. Butterflies are cold-blooded insects. This means that when they are kept at cool temperatures, they enter a state of natural hibernation. Essentially, they will be asleep for the entire journey, which keeps them safe and ensures their survival. Furthermore, all butterflies are fed and able to fly prior to their shipment to ensure that strong, vibrant and healthy butterflies arrive to your door… Guaranteed! When should I place my butterfly release order? Generally, the earlier the better. We recommend placing the order at least 10 days in advance to ensure availability (even earlier during summer months). Although we can usually accommodate last minute orders, we cannot always guarantee availability. Please contact us or call 407-366-8299 if you have any questions or would like to verify availability if your order is being placed less than 3 days in advance. How do I order my butterflies for release? You may order your butterflies online in our shop. Orders placed online are generally discounted, which would be applied automatically during the checkout process. If you have any questions about your butterfly release, please email info@clearwaterbutterfly.com or call 407-366-8299 to speak to a representative. For a Mass Release of Monarchs, a good rule of thumb is 1 butterfly for every 3 guests. For a Mass Release of Painted Ladies, a good rule of thumb is 1 butterfly for every 2 guests. This is due to the fact that the Monarch is a larger butterfly than the Painted Lady and fewer Monarchs will have the same visual impact as more Painted Ladies. For Individual butterfly releases, you should order 1 butterfly per guest. The average butterfly release order size is 4 dozen butterflies. Do you guarantee your alive butterflies for release and do you include extra butterflies? We guarantee that our butterflies will arrive alive and in healthy condition. Due to unforeseen circumstances, should any butterflies arrive deceased, please call us within 24 hours letting us know. We may ask for a few pictures to verify proof. We ship approximately 2-5 extra butterflies to compensate for potential casualties. THE RELEASE MUST BE MADE DURING DAYLIGHT HOURS AND MUST BE OUTDOORS. When will I receive my butterflies for release? The butterflies are shipped to arrive the day before your event for releases occurring Wednesday through Sunday. For Monday or Tuesday events, please call us or email us prior to placing an order to determine if delivery is possible. Please read our Terms of Sale for complete details. We recommend that someone be home to receive the butterflies on the day of delivery. The butterflies usually arrive before noon, but the exact time of day cannot be guaranteed. If it is not possible to have someone home to receive the package, we can have the butterflies shipped to another address or held for pickup at a local FedEx facility. Please contact us well in advance of the shipping date to make any modifications. Where do you ship your butterflies to? Painted Ladies can be shipped to any state in the Continental United States including Alaska. Monarchs can be shipped to any state in the Continental United States, except West of the Continental Divide due to environmental regulations. Why do Monarch butterflies cost more? Monarch butterflies are simply more difficult to breed than Painted Lady butterflies, increasing the cost of material, labor and time. It should also be noted that Painted Lady butterflies are nearly identical in color to Monarchs. Additionally, Painted Lady butterflies tend to stay around the area of the butterfly release much longer, because they are attracted to a greater variety of host plants than the Monarch butterfly. When and how do I release my butterflies? Butterfly releases should always occur during the daytime with at least 2 hours remaining before sunset. Butterflies do not fly at night. If they are released too late during the day, they may fly sluggishly or not at all. On a cooler day (60-74 degrees), leave your packaged butterflies outside in a shaded area for ~1 hour. On a warmer day (75+ degrees), leave your packaged butterflies outside in a shaded area for ~30 minutes. These butterfly release instructions are designed to be followed for both Mass and Individual Releases. NEVER leave your butterflies in direct sunlight or in a non air-conditioned vehicle. Is it okay to release butterflies into the environment? Yes! We ship butterflies to locations that already have native populations of the same species. For example, we do not ship Monarch butterflies west of the Continental Divide (California for example) due to genetic variations between Eastern and Western Monarch butterflies. 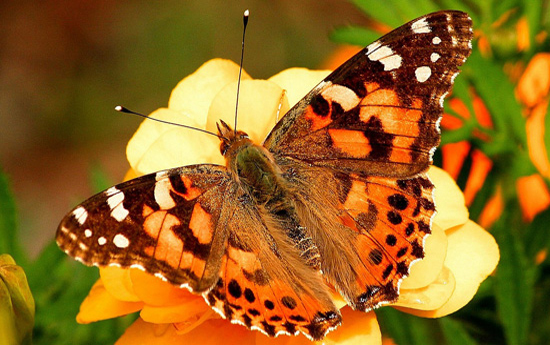 The Painted Lady butterflies live naturally in every state within the continental United States and Alaska. Additionally the USDA requires all shippers of live butterflies to maintain shipping permits. Clearwater Butterfly has all proper documentation on file and is available by customers upon request. How does temperature affect the butterflies? Monarch butterflies should not be released if the temperature is below 55 degrees and Painted Lady butterflies should not be released if the temperature is below 60 degrees, as they will not fly as vibrantly. Simply put, the warmer the temperature on the day of your butterfly release, the better (even if it’s a 100 degrees outside). Remember, these butterflies are coming from sunny Florida. They are accustomed to warm temperatures. We understand that weather is unpredictable, which is why we offer weather related cancellations. Please read our Terms of Sale for complete details. There is no need to worry! The care instructions are simple. A copy is included with every order and they are available online. They do not need to be fed or refrigerated. Try to disturb them as little as possible to keep them dormant. What happens to the butterflies after the butterfly release, do they stay around the release area? The butterflies are well known to linger around the release area for a few hours. In-fact, some stick around for weeks if the surrounding environment has their host plants. The released butterflies will fly around until they find suitable plants, where they will continue on with their lives. Since we ship butterflies only to states with native butterfly populations, our butterflies will be naturally accustomed to the local environment. We will always do our best to accommodate changes. Modifications of Shipping address: Must be made at least 48 hours prior to shipment. It is your responsibility to ensure we have received by both phone and email any changes to your shipping address. Modifications of Order: (Such as event date, quantity of butterflies, release method and personalization). Must be made and submitted by both phone and email at least 7 days prior to the date of your release. We are unable to make such modifications with less notice with the exception of increasing the number of butterflies in your order (subject to last minute availability). As a rule of thumb, orders and modifications should be made with as much advanced notice as possible. A full refund will be issued if the order is cancelled a minimum of 30 days prior to the event. Cancellation 29 to 8 days before the event will result in a 50% refund. Cancellation 7 days or less before the event will result in no refund. We do not refund monies due to inclement weather. If you have any questions regarding your order please contact us M-F 9:00 A.M. to 4:30 P.M. Eastern time at 407-366-8299. Can I return my live butterflies for a refund? We will not and do not accept the return of any live butterflies. How can I get good photos of my live butterfly release? 1. Refrigerate the desired butterflies for about 30 minutes. 2. Quickly take the hibernated butterfly and place them where you intend to take the photo. 3. As the butterfly warms, it will start to stand up and flap its wings slowly. You will have a solid minute to take pictures before the butterfly flies away, so have your camera ready!